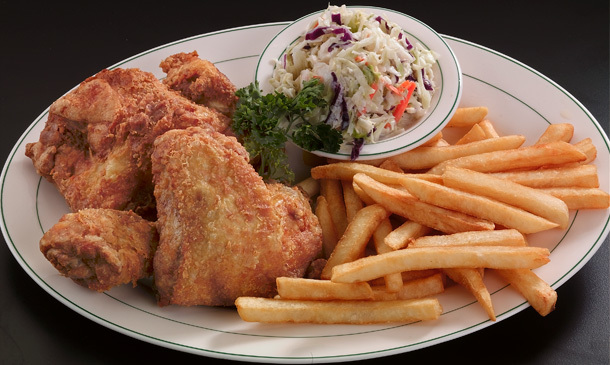 Includes Soup or Salad, French Fries, Cole Slaw, Roll & Butter. Fried Chicken StripsServed with golden French fries and Honey Mustard Dressing for Dipping. Athenian Chicken (Signature Item)Half chicken broiled with Lemon Juice and Oregano. Chicken AlfredoBreast of chicken Strips sauteed in Olive Oil. Served over Italian Noodles with Alfredo Sauce. Chicken AegeanBreast of Chicken Strips sautéed with fresh Tomatoes. Mushrooms, Green Onions. Basil and Garlic. Served over Angel Hair Pasta. Chicken MarinaraBreast of Chicken Strips sauteed with Olive Oil and served over Spaghetti with our own Marinara Sauce. Chicken MarsalaBreast of Chicken Strips sauteed with Burgundy Wine and Fresh Mushrooms, served with Italian Noodles. Stir Fried ChickenChunks of Chicken Breast Sauteed with fresh Vegetables, served with Rice. Chicken PicadoChunks of Chicken Breast cooked with tomatoes. Mushrooms, Bell Peppers, Onions, Topped with Guacamole And Served Over Rice. Chicken ParmigianaBreast of Chicken sauteed with Olive oil, and topped with melted Swiss Cheese. Served with Spaghetti and Marinara Sauce. Malibu ChickenBroiled Breast of Chicken with Sour Cream or Guacamole. Served with Choice of Potato.